HALIFAX – Halifax has a rich 260 year history. A lot of fascinating stuff has happened here, much of it has even been written down. Here’s a quick selection of some neat books I found on Halifax, and they’re all available through your local public library. 1. Halifax Street Names: An Illustrated Guide, edited by Shelia Mackenzie. Halifax: Formac Publishing Company Limited, 2002. 189 pages. If you find it at all interesting to know that Robie Street was named after Nova Scotian Judge Simon Bradstreet Robie (1770-1858), or that in the mid 19th century the south end of Brunswick street was known as ‘Knock-’em-down Street” because of the frequent brawls outside of the brothels and taverns on the east side, then this is the book for you. Halifax Street Names provides the reader with the histories of some of Halifax’s over 5000 streets. The book also has a number of cool photos of Halifax over the years. Halifax Street Names is sure to bring a little added appreciation to your daily dog walks and bike rides. 2. Historic South End Halifax, by Peter McGuigan. Halifax: Nimbus Publishing, 2007. 174 pages. The structure of this book is somewhat similar to that of Halifax Street Names, except instead of just street names, author Peter McGuigan offers engaging histories of the South End’s most interesting people and places. Starting in 1750, the book takes the reader through upper class suburbs, immigrant communities of the 19th century, and the construction of the railway and ocean terminal, among other things. Chalk full of excellent pictures and stories, Historic South End Halifax is another great pick. 3. Historic North End Halifax, by Paul A. Erickson. Halifax: Nimbus Publishing, 2004. 171 pages. This book looks pretty much the same as Historic South End Halifax, but, much like the North End, the structure and approach is somewhat different. While Erickson does take the time to highlight specific people and places, he also attempts to give the reader cohesive narratives on a number of historical themes. In this book you’ll find interesting accounts of the Halifax Explosion and subsequent rebuilding, “The Saga of Africville,” and post-war urban renewal. Definitely a good choice for those interested in the physical and social structures that have made up the North End through the years. 4. 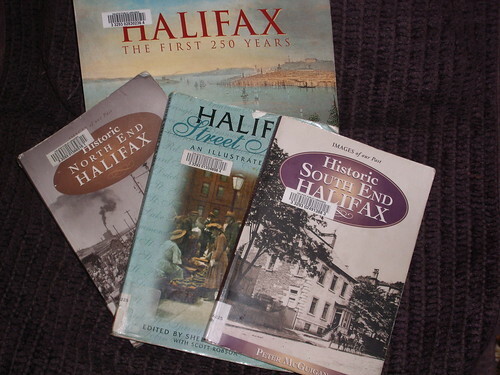 Halifax: The First 250 years, By Judith Fingard, Hanet Guildford and David Sutherland. Halifax: Formac Publishing Company Limited, 1999. 189 pages. If you haven’t figured it out already, I’m a big fan of illustrated history books — Halifax: the First 250 Years is no exception. This book is basically structured like your standard university text book, offering a pretty comprehensive account of the history of Halifax. Chapter 8 is all about the post-war urban renewal period, so probably especially interesting to those city-buffs out there. Thanks for the list! I’ll have to pick up the first book and get the story behind the street names. Ah! I was wondering about this over at Flickr. Thanks kindly for confirming my hopes! From an urban form perspective, probably one of the best books on Halifax is “Urban Structure – Halifax: An urban design approach” by Beverley Sandalack and Andrei Nicolai, published by TUNS press in 1998. It’s a great look at how Halifax’s urban form emerged and evolved through time and for lovers of older, more ‘spontaneously’ ordered urban fabrics, it turns into a bit of a tragedy at the end (the same authors did a somewhat similar look at Calgary, and that’s far more of a tragedy). If the four books above are ‘personalized’ history, with a focus on names, people, events, and so on, then this is a ‘structural’ history, with a focus on the anonymous rules and structures that shaped the field of urbanisation. In terms of graphics and imagery, content and ideas, it’s well worth a look for anyone who is interested in the form, character, history, and future of cities in Atlantic Canada and throughout North America. That sounds like a really great book. Please keep the suggestions coming I know I haven’t even scratched the surface with my selections.